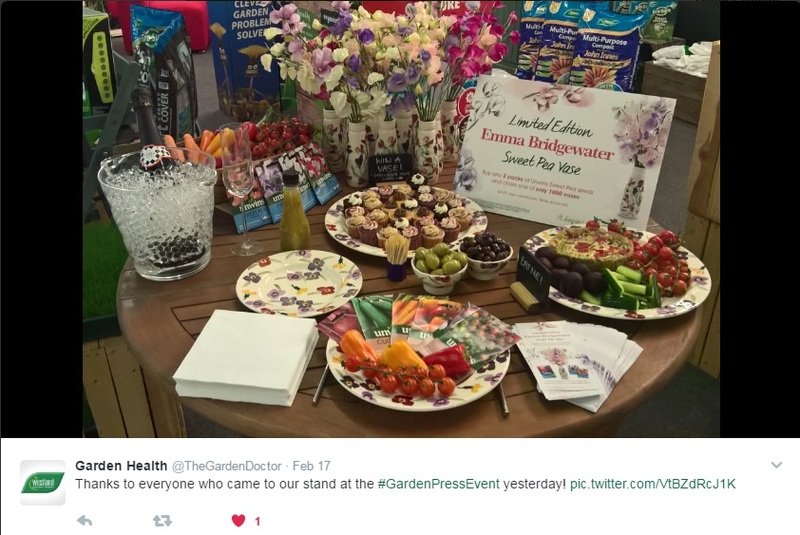 For me February's Garden Press Event is the start of the gardening season. Everyone's happy to be there after a long winter, plus the exhibitors are keen to talk and add a touch of inspiration to gardening plans and articles. Westland's colourful stand was the one which greeted me first, and I was so bowled over by their gorgeous sweet pea vase I forgot to take a photo. Sadly I didn't win one of the 10 available on the day, but I'm just as delighted with the packets of sweet peas they gave me. I'm planning to grow lots of highly scented flowers on the allotment this year as part of my Flowers for Mum project - more on that soon. 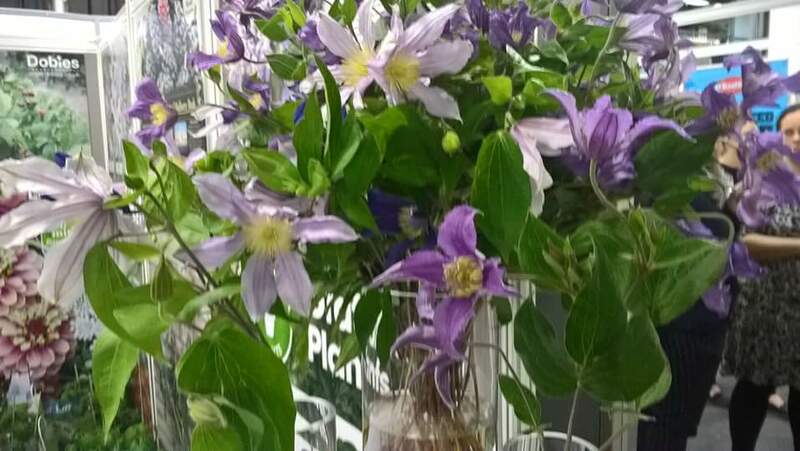 Regular readers know of my love of clematis, so they'll understand why I was taken by the new range of clematis on the Suttons/Dobies stand. The flowers are born on longer stems which means they're perfect for cut flowers. The light pink flower is 'London', the darker flower is 'Oslo' (I think) and there's also a stripey dark pink 'Rome'. They're something to ponder for my Flowers for Mum project - I'm sure I must have room for one somewhere! I was also taken with their new dwarf mulberry 'Charlotte Russe', which can be grown in a pot. I'm allowed to scrump the mulberries at West Green House, so I'm pondering which of my patio pots should have one of these. Note the current batch is sold out and orders are being taken for a fresh delivery of plants due early September. Burgon and Ball always have plenty of stylish and practical ideas and I'm chuffed with my new Hip Trug. 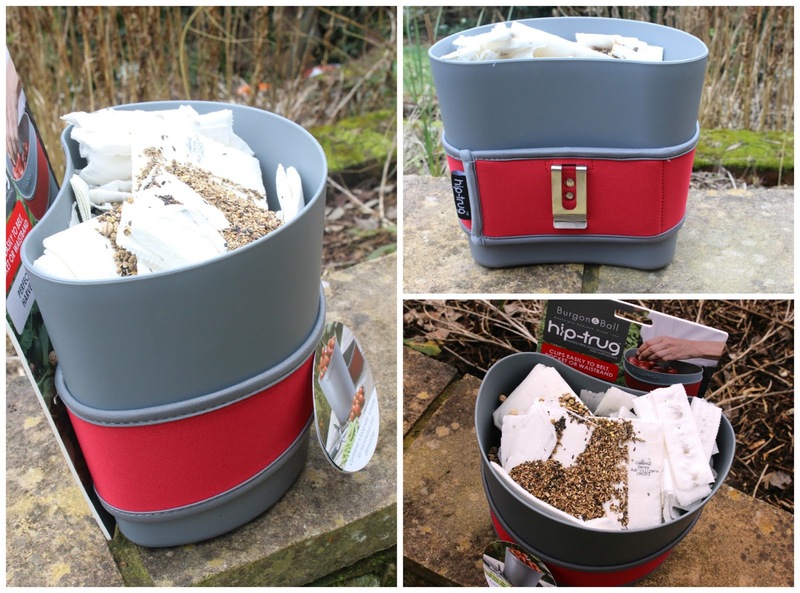 I used it as an emergency caddy recently to take my out of date seeds down to the compost bin, and it's main use will be for harvesting produce at the allotment. I've often thought I need three hands when I pick my gooseberries and raspberries,* so this is going to be ultra-useful come the summer. 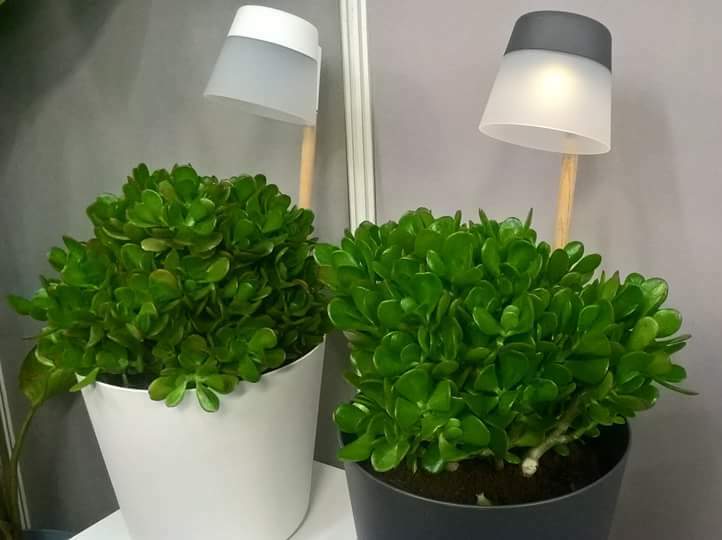 Lots of stylish pots were in evidence at the show and my most unusual find were these complete with solar lighting from Elho. I also liked their new Door Stopper, which will solve a problem for me when NAH's home made ones bite the dust (due imminently). I like the idea of a dual purpose planter to move back with the other ones when it's not needed to prop open our patio doors. Have you ever found something new and then seen it pop up in all kinds of places? Kokedama is doing that for me. I first came across this Japanese technique last year, and in the past month or so I've seen it at Chelsea Physic Garden & Easton Walled Gardens (snowdrops) and Munich (tulips). 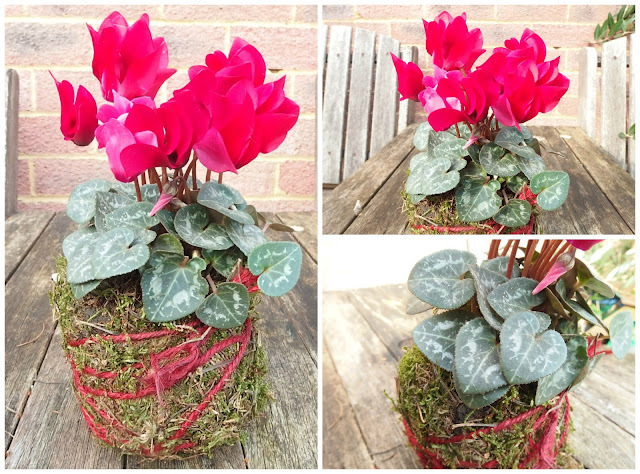 Now I have one to call my own courtesy of the lovely ladies on the RHS stand and their gift example using cyclamen. The matching red string highlights how well wrapped the moss ball needs to be to keep everything in place. After a good drink it's now sitting happily on my bedroom windowsill to greet me each morning. 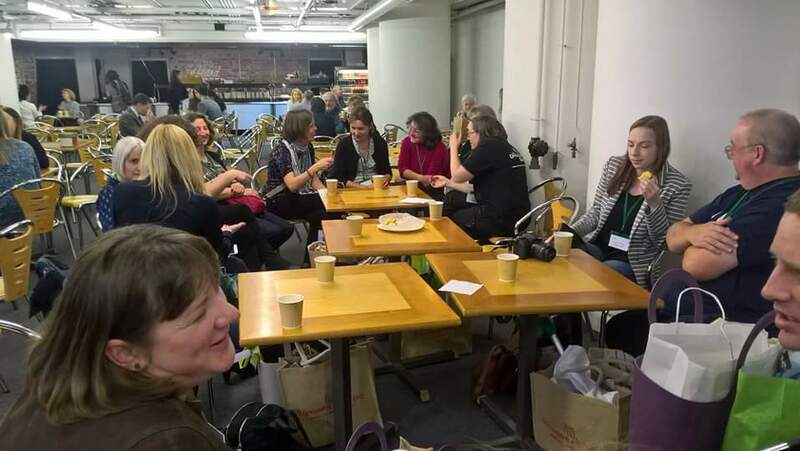 One of the best parts of the day was our garden bloggers get together in the afternoon, where Emma kindly gave us a good excuse to sing happy birthday and celebrate with Beryl's lemon drizzle cake. It struck me at the show how attitudes have changed towards bloggers since I starting going there a few years ago. At first we were largely ignored, but now companies welcome us with open arms. We have the ability and opportunity to tell quite different stories compared to conventional media, and highlight those items which 'speak' to us as the potential users of them. Thanks to Sara and Emma for their different perspectives on the day. I'll add more when I find them.